The Women's Keb Jacket from Fjallraven is well-ventilated outdoor jacket for longer treks in the mountains in varying terrain, where freedom of movement is just as important as durability and protection from sharp stones and the like. 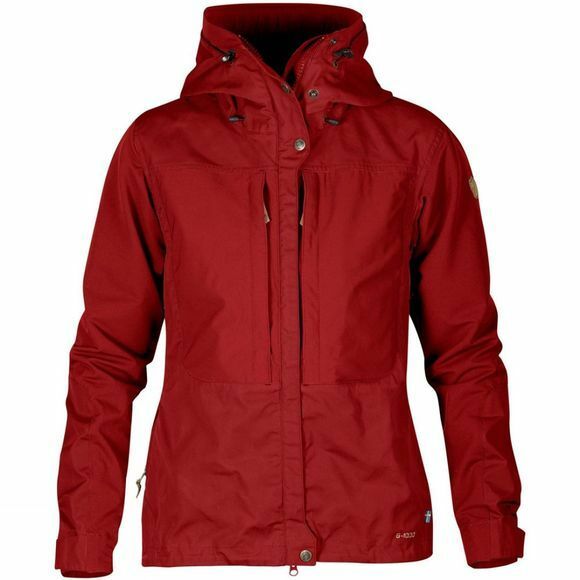 Combines wind and water resistant G-1000 Eco in recycled polyester and organic cotton on the hood, shoulders, front and extra long lower panel at the back, with stretch fabric across the back, on the arms and pockets. Carefully designed details that give an excellent fit, such as gussets under the arms for extra freedom of movement and seams that have been moved forward so they do not interfere with hip belts on backpacks. The improved hood has a bit more space around the neck, a better fit for wearing over a helmet and is easier to repair – the cords are now on the outside so easier to rethread if needed. The brim of the hood has an inbuilt brass wire and can be folded back at different positions, depending on whether you want maximum protection from the wind or more peripheral vision. Ventilation openings under the arms with two-way zips release excess heat. Two vertical chest pockets with inside mesh pocket in the left hand one – perfect for a telephone. The two-way zip is hidden behind a protective flap with buttons at the top and bottom. There is also more stretch around the cuff and added loop inside chest pocket for attaching gear.